This hip and very private Master Bedroom with bath is located 11 miles from PDX. This town home is just minutes from the Vancouver Mall which has 140 shops and many great restaurants. My favorite is the new waterfront development on the Columbia River with state of the art restaurants just minutes away! The drive over the river is 10 minutes to the great world renowned Portland eateries. The famous eateries include Portlands top chefs restaurants Le Pigeon, Toro Bravo, Beast, Paley's and Mother's Bistro & don't forget to check out Mississippi Ave. lined with eateries. My favorite is Thai Eatery Mee Sen. And find extravagant cocktails at Moloko Bar. Check out Portland weird food carts. Also, the world class Pinot Noirs and other varietals are produced nearby in our Willamette valley, where there is ideal grape growing conditions, innovative wineries and knowledgeable wine bars. Yes! You have Wifi! You will be sleeping in comfort with a super relaxing new Sealy Posturpedic Queen size bed! You have Comfort in Style!! 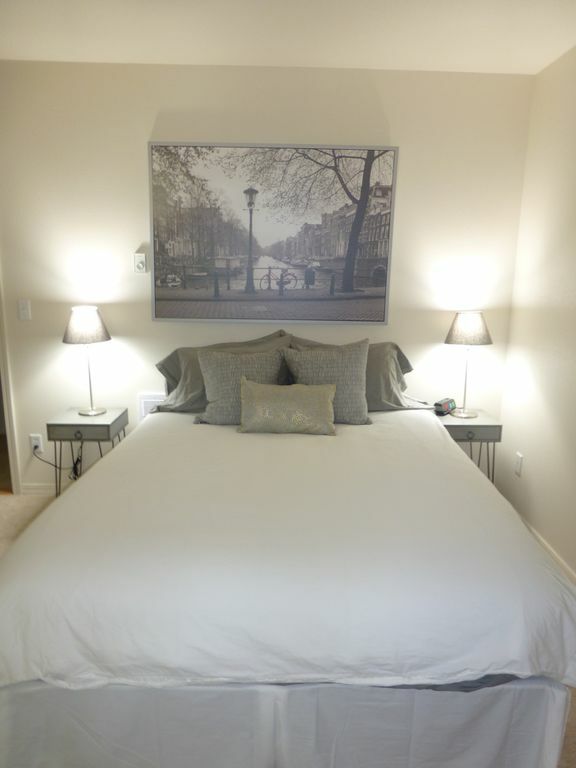 You will have a private entrance to this one bedroom with lock and amenities. This room is furnished with a Kuerig coffee maker, refrigerator, snacks and microwave. I recently purchased this 3 story town home which has three master bedrooms all with bath and half bath with a spacious deck which overlooks wetlands with a view of Mt. Hood with a ton of privacy. This is an oppurtunity to host and offer a clean and private stay for a very affordable price! In my opinion, it has a feel up a 5 star hotel with its own entrance. A very private stay! The room you choose to stay in has a very soothing feel... all done with gray textures! Enjoy!! This very private room is located in a private community which means you will most definetly get a very great nights sleep! Centrally located close to shopping, dining ,hiking the gorge and the beach. A side area is set up with a microwave, refrigerator and keurig coffee maker. We arrived to discover the place we rented was just a room located downstairs in a split level condo. I thought it was a 1 bedroom condo and we were renting the whole place. ...i'm not used to sharing a home with others I don't know, but it turned out pretty good. I never ran into Sally but she was always available via VRBO messaging, so that was nice. Sally is a very nice lady and very accommodating. Honestly, I had a great time. Only things I would change would be the description of the unit to include that it's located down stairs thus would be a challenge for people with a handicap and that it is a master style bedroom in a multi bedroom condo on a different floor from the rest of the rooms so people are more prepared for what they receive. I did notice it said private entrance on the descriptor. I guess I was just expecting something not accessible by the rest of the place. But I guess that's hard to do when the room is right next door to the garage. Nonetheless, had a great time and liked the location. Thank you, Sally! The place was perfect for our visit with our children. We hung out and cooked at their place. It was clean, quiet and comfortable. The bed and mattress was nice and firm with no valley in the middle. Lovely room, just as pictured. Very clean. Instructions for entry were clear and accurate. Thank you Stephanie! Please hurry back! Sally is a wonderful host providing lovely accommodations in a quite neighborhood! Delicious coffee and I enjoyed the soaps that were provided! Definitely plan to schedule again next time we are in Vancouver. The wineries are plentiful nearby in the beautiful Willamette Valley. The Vancouver Mall with 140 shops is 0.7 miles within walking distance with eateries all around! River Rafting in Mopin is a highlight in the Northwest.